Does weight lifting increase testosterone naturally? Today I’d like to dive deeper into the discussion around weight training and testosterone. I want to discuss how proper and intelligent weight training increases testosterone naturally as well as address some of the questions people have been asking about training. While I have been super excited about how many guys have embraced my new THOR Testosterone Training Program, this program is filled with testosterone boosting workouts and diet information. I realize that it may have created a bunch of new diet and training related questions with relation to testosterone training. In fact, it’s fair to say that the THOR Testosterone Training Program has created more specific testosterone weight training related questions than I was expecting. While this might seem like it is making a bunch of work for me, it’s actually pretty fantastic. You see, I’m realizing that the AnabolicMen.com audience is one of the most intelligent, well read audiences when it comes to fitness and training. While the AnabolicMen blog gets a bunch of visitors that are brand new to training, there are a ton of you that have been training for years and want to know how you can squeeze the absolute most out of your training by using the testosterone boosting workouts included in the THOR Testosterone Training Program. Some of the questions I received about THOR are related to how it compares to low volume training, like “Power Factor Training”. Similarly I have received questions from people who are used to high volume training such as that promoted by trainers like Scott Abel. Finally, a bunch of guys are asking about THOR and its relation to other low volume training programs such as Kinobody by my good friend Greg O’Gallagher. What I have realized is that you guys are not content with me telling you why my THOR training manual is conclusively the best way to train for natural testosterone enhancement. You want the reasoning behind everything in the program and how the testosterone boosting workouts are formulated. While I tried to include most of my reasoning in the various sections of the program, I realize that I could be more specific about why I have chosen one training methodology over another. To start off this series explaining my thought process I will go over how THOR weight training increases testosterone naturally and more optimally when compared to very low volume training programs. The one I have repeatedly been asked about is how it compares to “Power Factor Training” and similar programs. Super low volume training programs come in a bunch of different flavors. There are ones like the power factor training program that rely on close tracking of the sets, reps, weight used and total time to completion of a workout. Then there are HIT programs that rely more on limiting the volume of exercise to one or two max effort sets per muscle group. While there are aspects of low volume training that THOR definitely mimics, relegating training to 1-2 all out sets is definitely not one of them. The reason for this is actually pretty simple. 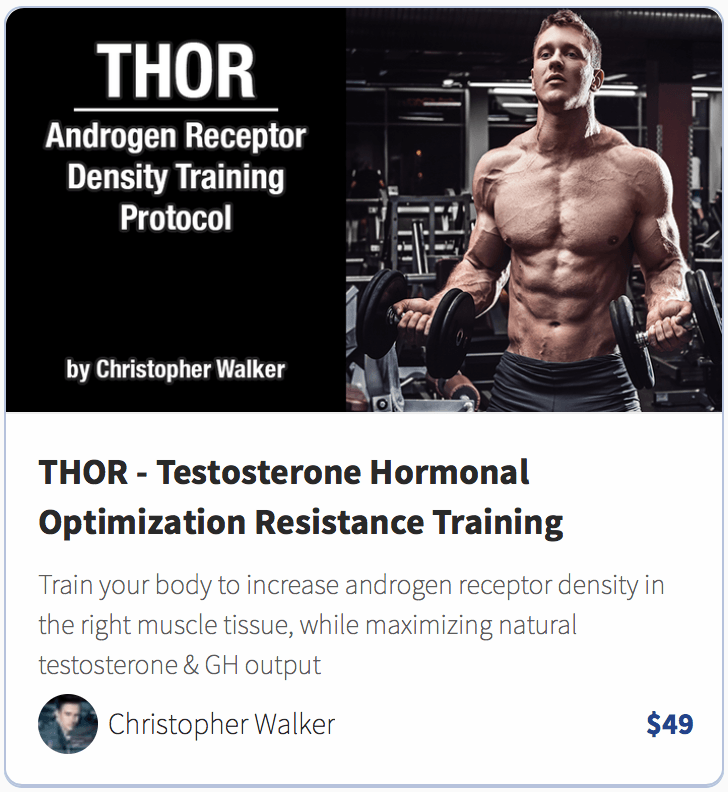 The THOR program weight training increases testosterone naturally by focusing on creating a specific neuroendocrine response so that your body will be forced to increase its production of anabolic hormones in the long run. Where most very low volume programs are attempting to create workout to workout improvements in strength or muscle size, the THOR program aims to slowly increase baseline anabolic hormones. For example, if you are not increasing your weight workout to workout, or some aspect of your loading parameters on one of these ultra low volume programs, you would not be successful. Since the entire goal is to increase some aspect of loading parameters you need to do that to make progress or be considered successful. While the THOR program places a premium on strength, ultimately circulating testosterone levels should be the ultimate source of feedback regarding workout progress. Don’t get me wrong, I highly encourage you to track your lifts and attempt to progress workout to workout. However, the program is designed for hormonal optimization first and foremost. This means that a combination of factors has to be taken into account. 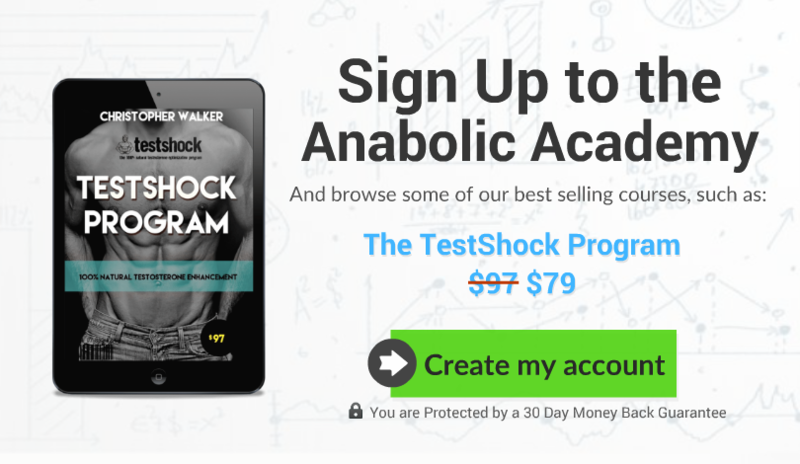 First of all, you need to keep in mind the rough formula for hormonal optimization outlined in the TestShock manual. So when looking at this formula, you should read it as follows: Muscle Volume Activated (MVA) times the level of Intensity (I) is multiplied by the total amount of Work (W) that is done below the Stress Threshold. This is simply a way to describe the level of stimulation that is optimal for maximum hormonal output. 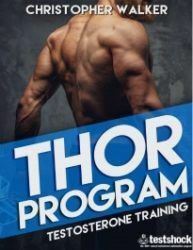 The THOR Program was developed to show men how to use weight training to increase testosterone levels. By using explosive power movements, you can increase T and GH output via training. While I am the first person who has described this concept with a formula, I have not invented anything new. Intelligent trainers over the world over have noticed a similar phenomenon in their own training. You can see one of the most famous fitness authors discuss his experiences using explosive reps and stopping when the weight begins to slow down. However, he does not talk about intelligent weight training to increase testosterone levels. That’s where THOR comes in. While this author does not use the description “below the stress threshold” to describe his approach to limiting volume, his intentions when telling trainees to “work until bar speed noticeably decreases” is similar. Interestingly enough, this author urges the trainee to focus on speed of execution rather then absolute weight on the bar in the workout. He even goes as far as to give guidelines to strictly limit the weight used in order to maximize potential power output. At this point it is important to point out that many ultra low volume trainers believe that max power output can be achieved with their methods. Let me start by saying that this may or may not be true. As with everything on the site, it depends on the context. One of the reasons “working below the stress threshold” or “working until the bar speed noticeably decreases” is so important is that it allows for accumulated work at a relatively high level of power output. This is the (W) work aspect of the equation W(MVA*i). You can perform a higher volume of relatively high intensity work if you limit your exposure to the most draining sets. If you push too high on the intensity, or don’t stimulate the neuromuscular system enough with an adequate volume of work your body will not progress in the long term. What the THOR program or the neural charge protocol mentioned above have in common is that they provide a simple intuitive means of short circuiting the body’s natural limiters. Where super high volume creates metabolic fatigue and super high intensity creates neurological fatigue, the correct amount of near limit training creates the largest neuromuscular impact the smallest relative cost to systematic recovery. In ultra low volume training you are generally preforming some type of compound movement for 1-2 sets at near limit intensities. In this case you are trading your ability to perform a higher volume of work for an extremely high intensity. Weight training increases testosterone levels only when the training is done properly. In the case of ultra low volume training, you completely ignore your body’s own biofeedback in exchange for getting as close to momentary failure as possible. Many of these protocols will have you grinding out reps very close to failure. While this type of training will allow you to progress very quickly on the movement you just trained, it does so at the expense of your ability to progress on other exercises, at other workouts and consistently over an extended period of time. This is because pushing through all your perceived limits has an extreme effect on your nervous system. Pushing yourself to the limit, while excellent for building mental fortitude, is a less then optimal way to achieve a training effect over the long term. You cannot expect to blow out your nervous system 1-2 times a week and get into awesome shape. This approach looks at the muscular system like a piece of machinery. Ultra low volume programs assume that placing increasing levels of mechanical load on your muscular system over time will cause the body to adapt. This does not take into account the dynamic interplay of things like the: sympathetic and parasympathetic nervous system, musculoskeletal system, cardiopulminary system and neuroendocrine system. These systems are so intertwined that many researchers classify a number of systems together as single units. A great example is the classification of the neuro-cardio-endocrine system in this research study done to identify the system’s response during an acute subarachnoid haemorrhage. If you are unsure of what the above study is discussing don’t worry, it’s not the point of the article, though it does sound pretty serious. The main point is that any program designed to look at the body like a machine is flawed. While you could look at the body as a complex machine, doing so would require you to consider variables far removed from anything you could hop to manipulate with specific set rep protocols in the gym. Seriously, we need to be more realistic, when you’re talking about the body’s neurological and endocrinological responses to training things get complicated fast. That’s why, as mentioned in the article Engineering a High Testosterone System, I discuss how complex system should be manipulated with simple variables. In terms of training those variables are rep speed and ………..that’s it. So the training variable is rep speed. The reason for this is that simplicity get people results in the long run. If you want to get scientific, go beyond the ultra low volume magicians and technically perform at your best at each workout you will need to use biofeedback. Biofeedback allows you to pay attention to the signals your body is sending in terms of how your are feeling. This is because the intuitive sense of “how you are feeling” captures the thousands of individual variables that determine your bodies muscular, skeletal, neurological and endocrinological readiness to perform more work. Learning to regulate your training based on biofeedback is awesome, but is a training system in itself. You can see some well respected authors discuss the concepts more in this article on three ways to use biofeedback training and this article on neural charge training. The reason I don’t use these methods and I don’t feel they are the best for you is that they take time, concentration and study. While I am all for putting in effort, that effort needs to be balanced against the competing priorities in your life. This article on focusing your energy to set and achieve your personal fitness goals discusses this topic thoroughly. Basically, it is counterproductive to worry about more details then you need to. The THOR program uses intelligent weigh training to increase testosterone by limiting volume to the reps and sets to ensure the average guy will have gas in the tank to perform all reps explosively. Features of the program such as 2 days per week in the gym and one on the track as well as reverse pyramid training ensure that you will not be walking the fine line that is the stress threshold. The programs mentioned above that allow you to get the maximum amount of high quality volume are made to give trainees that ability. The THOR program is the best workout to increase testosterone naturally because it allows you to get 90% of the benefits with none of the hassle by simply asking you to perform all your reps in as explosive a manner as you can. Long term recovery is guaranteed with a moderate volume split. Similarly, the program is designed to take recovery into account between workouts. In order to get the largest neuroendocrine response you are hitting your body every day you are working out. The two gym days include movements for the whole body. The track day utilizes the whole body by including both sprints and muscle ups. While it is technically possible to train the body at just the right intensity to utilize a higher frequency program, the amount of hassle in terms of planning the training and moderating the intensity is far more complex. In my opinion it is not even close to worth it to try and design a program that allows you to train every day. As with trying to eek out the most volume during your workouts, trying to eek out as many workouts as possible throughout the week is un-necessary. you can achieve 90% of the results with little to no headache by using a simple program. We recommend you use the THOR Program from the Anabolic Academy as it is the best workout to increase testosterone. You get the maximal androgen output in precisely the right androgen receptor dense muscle tissue with power based movements, which also builds a naturally powerful masculine physique.